It’s become part of mainstream media to hear about the ways in which medical science is trying to beat the clock. But who wants to live forever? If we had the keys to our mortality, would we choose to just keep going? Humans are conditioned to understand that the physical world is finite; all forms of life end somewhere, us included. Perhaps what we seek is not how to live forever but rather, how to live well. Although we’ve not found the Elixir of Youth, there are many examples of older folk doing it right in the simplest of ways. Across the globe regions called ‘Blue Zones’ are places where people live longer than the global average and, statistically, are home to the oldest and healthiest people on the planet. There are 5 Blue Zones globally; Sardinia in Italy, Okinawa, Japan, The Seventh Day Adventist community of Loma Linda, California, Costa Rica’s Nicoya Peninsula and the Greek Island of Icaria: and all of them have an unusually high volume of nonagenarians and centenarians living there. What contributes to the longevity in these Blue Zones is a set of lifestyle habits which are simplistic in their application and easily achievable. Here, living well is less about economics and more about lifestyle. Among the list of longevity habits in the Blue Zones are the obvious: eating a mostly plant-based diet, keeping active and watching calorie intake. What’s interesting though is the time and importance these people give to their emotional well-being. These citizens actively spend time with their families and willingly pursue friendships as well, emotional well-being is driven by a sense of purpose and inclusion which directly impacts their overall health. Although Blue Zones are the blueprint for living well later on, globally people are living longer anyway. Previously, one’s twilight years were the pre-cursor to the end but today retirement has changed, and it is retirees driving the revolution. Retirement-centric property development has had to adapt to the needs and desires of this powerful market to understand that holistic well-being is top priority. 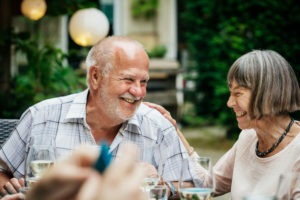 Retirees want to live where socialisation is deliberate, where they can interact inter-generationally and where they know their nutritional needs are taken seriously. A new wave of retirement living in sweeping through South Africa where ‘old age homes’ now take cues from the Blue Zones to boast cool interiors, highly-qualified and experienced staff and ample opportunity for socialisation- an all-round package to feeling good and living well. Locally, retirement villages have become more holistic and comprehensive in their offerings with state-of-the-art care centres, like the Mount Edgecombe Care Centre, emerging to shake up this stagnant and under-serviced market. Being located within the Mount Edgecombe Retirement Village, residents have access to a host of opportunities for well-being, socialisation and inter-generational interaction seen through the estate facilities on offer.